This is a step-by-step recipe to make spicy, crispy and delicious authentic Maharashtrian Style Jowar or Sorghum Flour Chakli. 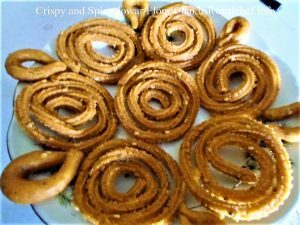 Normally Chaklis are prepared using Chakli Bhajani, Rice or Moong Dal Flour, however, when Chakli Bhajani is not available in the house, you can try making Jowar Flour Chaklis. Jowar Flour Chaklis can be served as a snack or even be added to the Diwali Faral. Take the Jowar Flour in a large Thali and add the Red Chili Powder, Sesame Seeds, Poppy Seeds, Black Cumin-Coriander Powder, Asafoetida and mix it thoroughly. Take a thick bottomed vessel and boil the Water, Oil and Salt and remove from the flame and then add the Mixed Jowar Flour and mix it thoroughly and then cover the vessel with a lid and keep it aside for about 2 hours. This will make the Jowar Flour Doug rise. Then, after two hours, remove the lid and fill the Jowar Flour Chakli Doug into a Chakli Maker. Before inserting the Chakli Dough, a little bit of water should be applied inside the Chakli Maker so that the Chakli Dough does not stick and comes out smoothly. 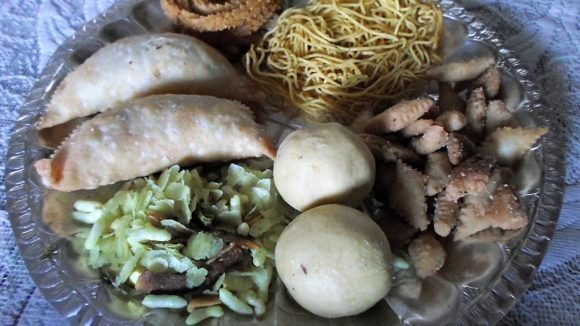 Then, prepare the Chaklis on a plastic paper sheet. Then, heat Oil in a Kadai on a high flame and after the Oil is well-heated add the Chaklis and then lower the flame. Deep-fry the Chaklis on both the sides and remove them when they turn well-browned and crispy. When the Chaklis cool down put then in a plastic bag and store it in an air-tight container.